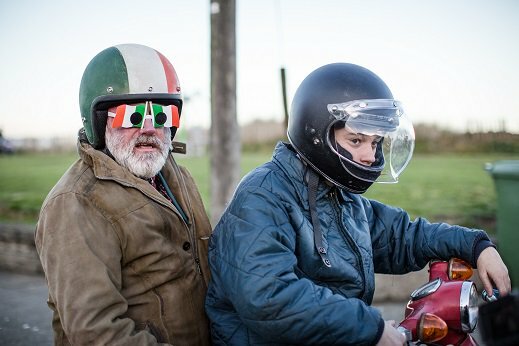 The Belly of the Whale is a film by Irish director Morgan Bushe and follows two down-and-outs bonded together in misfortune who devise a plan to rob a small town amusement arcade. Planet of Sound served as music supervisors for this project. Dina & Rory are music supervisors for the film which includes music by Irish band Fontaines D.C.
We provided clearance consultant services for the 2016 independent feature film 'White Girl', researching song ownership and obtaining/negotiating license fees for various songs. Whale Wars follows the Sea Shepard Society and their mission to save the whales in the Arctic Ocean. We worked as consultants for the show theme and secured rights for theme use of the powerful and intense "Bullet with Butterfly Wings' by Smashing Pumpkins for all seven seasons of the series. Planet of Sound has worked as a Music Consultant for Animal Planet on various network branding campaigns and ID promos. Their 2014 Branding campaign featured the song "Black Skinhead" by Kanye West and various pod busting spots for the network. Man vs. the Universe is a three part series for Science Channel that looks into the latest technologies and advancements being developed by NASA and private business to bring space exploration into a new golden age. The song "Outro" by M83 was used in the promo to launch the series. Bitchin' Rides follows Dave Kindig, owner/operator of Kindig-It Designs. Dave turns out one-of-a-kind vehicles for his demanding and successful clients. Planet of Sound secured rights to use the track "Bright Lights" by Gary Clark Jr. as part of the Season 2 series launch. Jeremy Wade of River Monsters takes viewers along as he unravels freshwater fish tales of giant killers where sometimes the fact really is stranger than fiction! These voyages have taken him far and wide across the globe on an endless search for man-eating creatures. "The Beginning is the End is the Beginning" by Smashing Pumpkins was used for the Season 5 series promo and "Animus Vox" by The Glitch Mob was used for the Season 6 series promo. Making it Big was a reality program for the Oxygen Network that followed various creatives trying to make their mark in the advertising industry. As music director for the Oxygen Network, Dina was instrumental in securing "Big Time" by Peter Gabriel as the show's theme music. A Tale of Two Wives was the first original feature movie for the Oxygen Network, a co-production with Working Title Films. Dina served as Music Supervisor for the film which featured music from Macy Gray, Joan Osborne and Adam Schlesinger. Mermaids (The Body Found and The New Evidence) was an original fiction program for Animal Planet that focused on a group of scientist who discover a mermaid on a beach and the documentation to prove the evidence credible. The programs feature music from The Kronos Quartet, Moby, John Murphy and Sickoakes. Fight Girls was a reality series for the Oxygen Network following a group of ten women who live together and train with a Muy Thai instructor to ultimately compete in Thailand. Dina was instrumental in finding and securing the song "Fingerprints" by (at the time) up and coming artist Katy Perry. Inside the Dragon's Lair follows cameraman Didier Noirot and environmental photographerRoger Horrocks into the deep papyrus caves of Botswana's Okavango Delta. Their goal is to get up close with one of nature's most fearsome predators: the Nile Crocodile. The Eels "Fresh Blood" was used as both theme for this Animal Planet special and within the program.